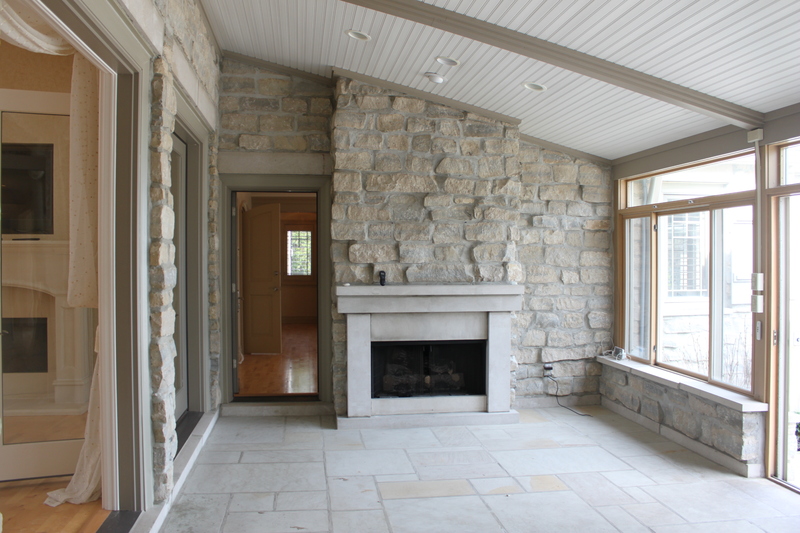 This renovation project in Avon Lake, Ohio alongside Lake Erie needed some major TLC. We replaced the flooring throughout the home with Legno Bastone’s wide planked wood flooring, Mykonos. A detail in the home that we really liked and worked off of were the large archways in the main living area. This light and bright space made for a great renovation project! We chose a monochromatic color scheme for the master bedroom. It evokes a sense of peace and serenity. The custom striped chaise is perfect for lounging and looking out the bay window into Lake Erie. We layered neutral colors together with a variation in tone and texture to create visual interest. 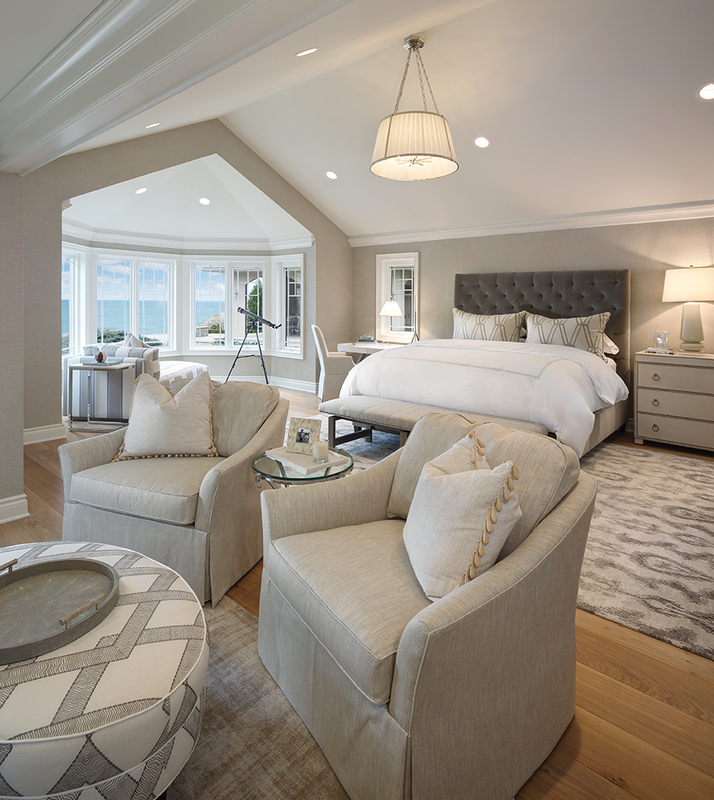 Traditional furnishings such as the tufted headboard and the skirted arm chairs are timeless and sophisticated. 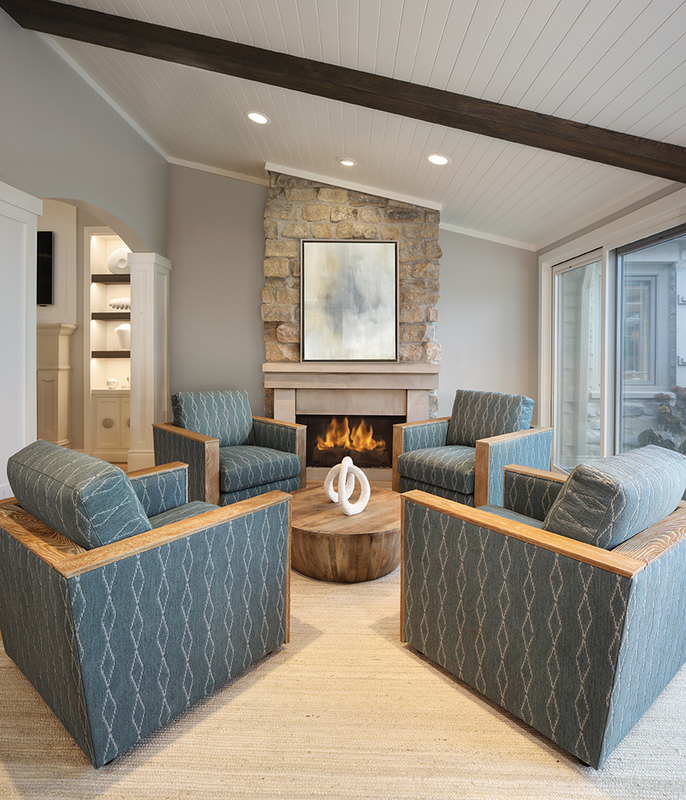 This room is a harmonious blend of patterns, textures and classic design elements. 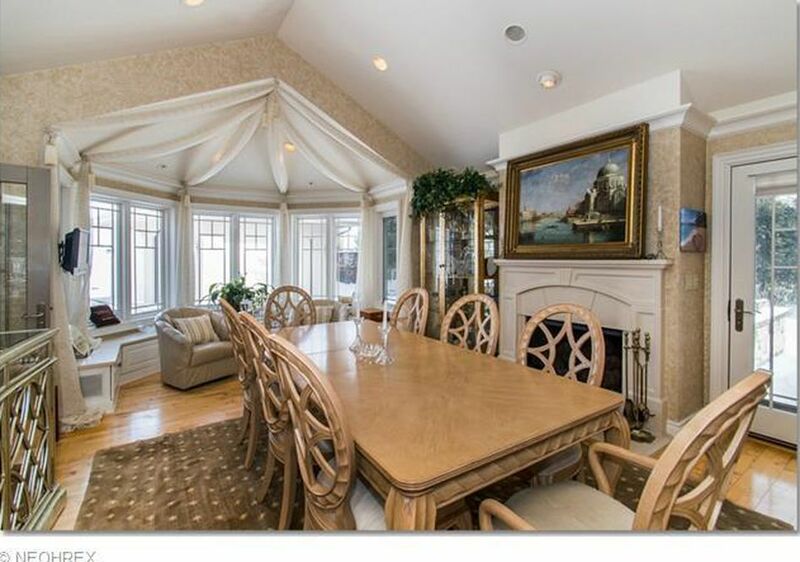 The hearth room was once a covered sunroom that we reworked to be on the interior of the home. We retained the stone on the fireplace mantle and added four cozy lounge chairs and a small cocktail table. 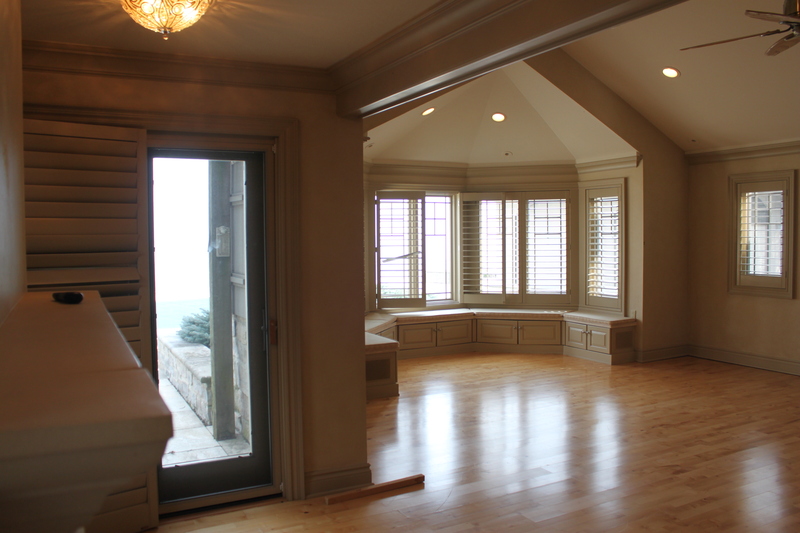 The white columns help to separate this space from the main living room. 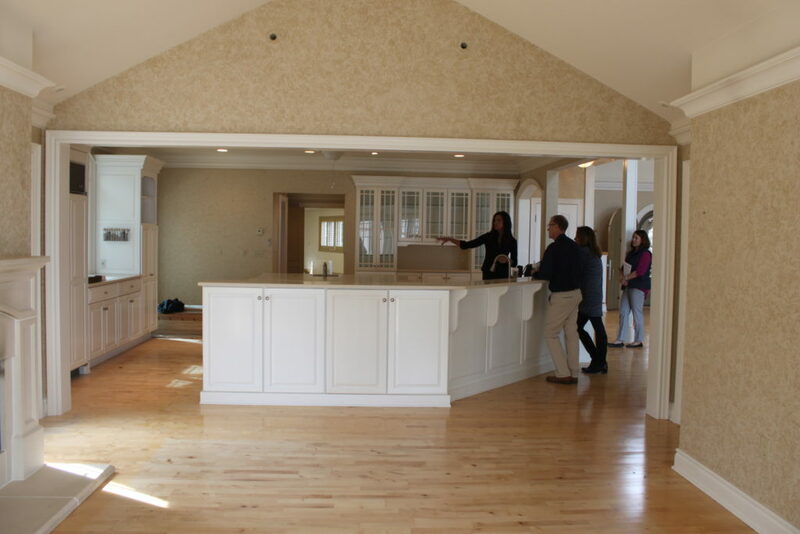 The space has a nice flow and opens up the home for additional seating areas. 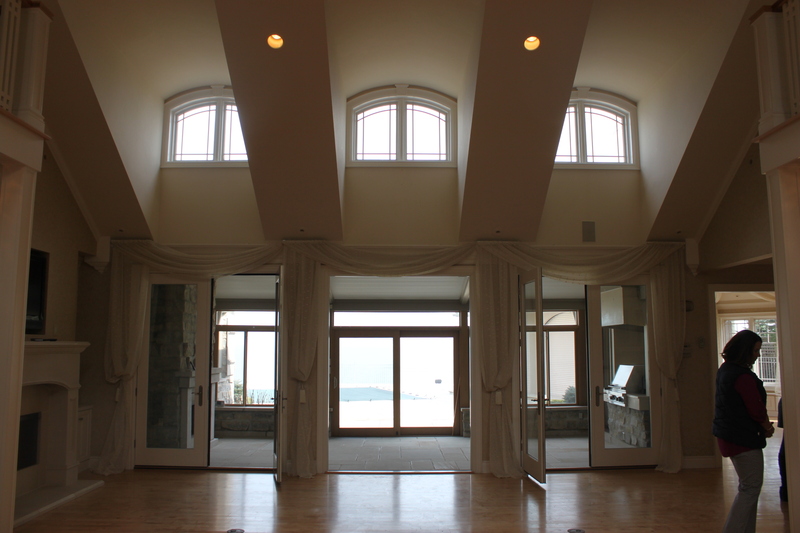 One of the highlights of this home are the gorgeous archways and abundance of windows along the perimeter. 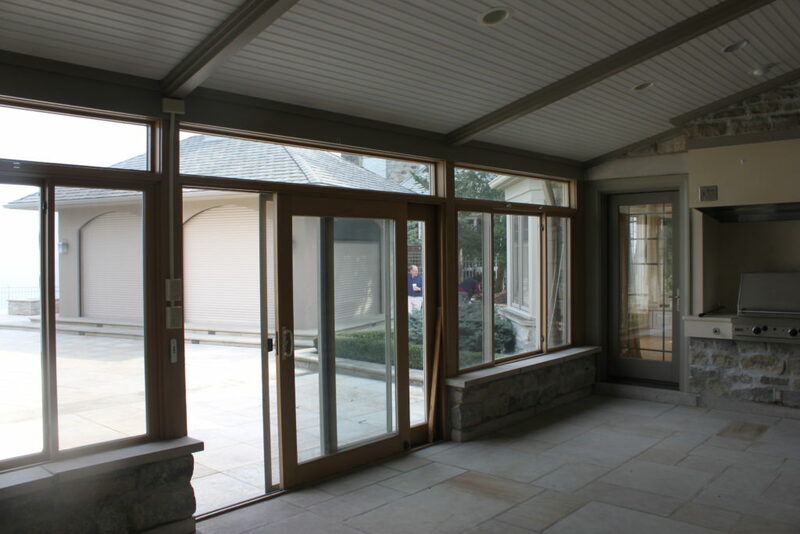 The windows allow for an expanse of natural light to flood the space. 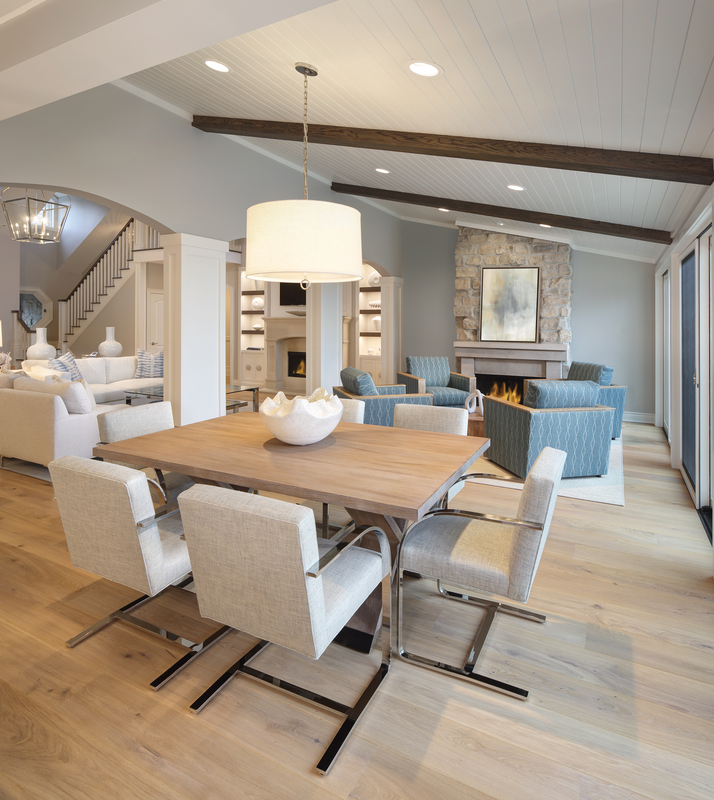 To keep things light and bright, we used a variety of cool neutrals and blue tones. We wanted to keep the furniture very casual and stream-lined. Geometric patterns and clean lined furnishings juxtapose the round arches. We reworked the kitchen and knocked down the wall in the old dining room to create a more open layout. 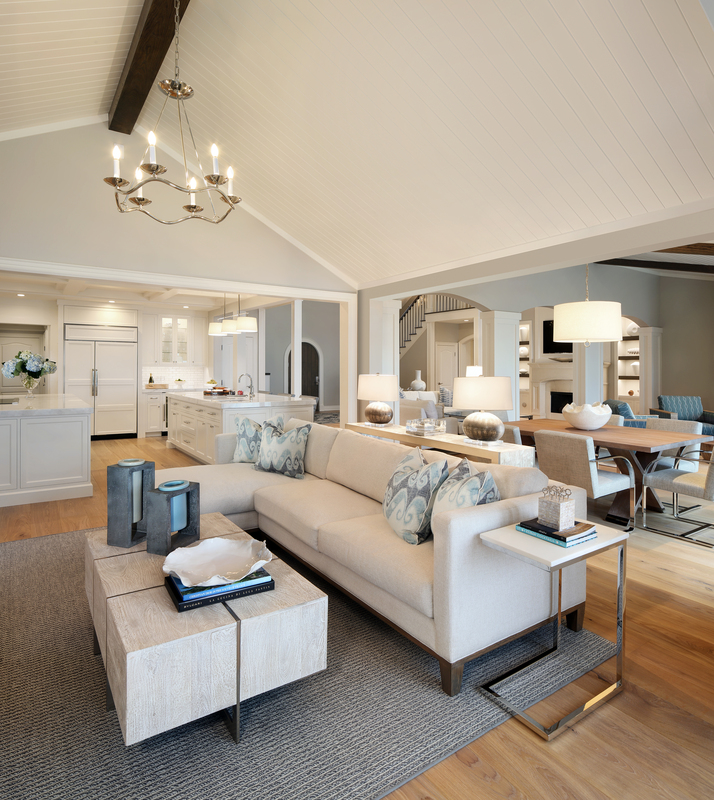 The addition of two double islands expands the space to look twice its actual size. We also added a coffered ceiling detail to anchor the space. 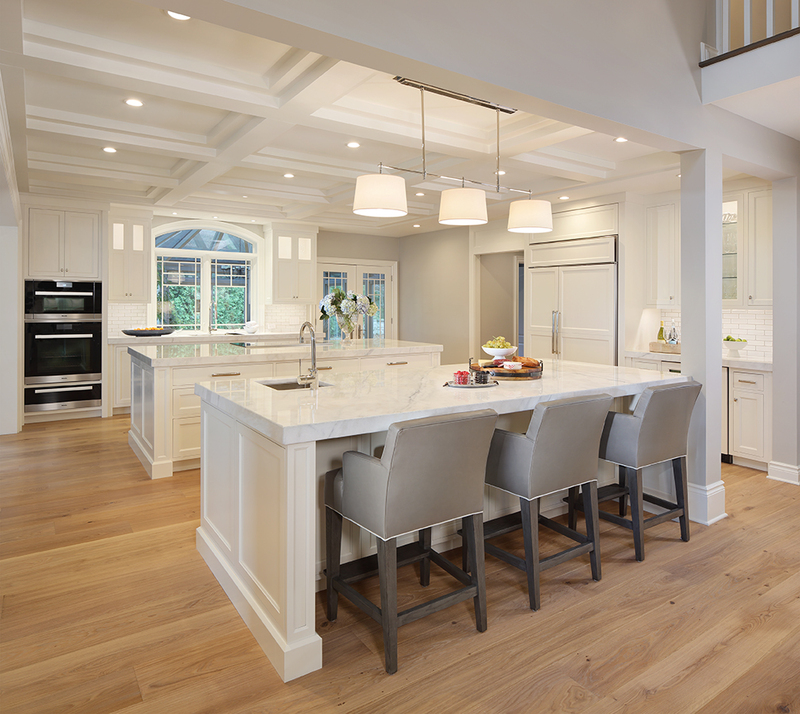 This clean and classic white kitchen turned out stunning! Love this design! What is the grey that you used for the rooms? 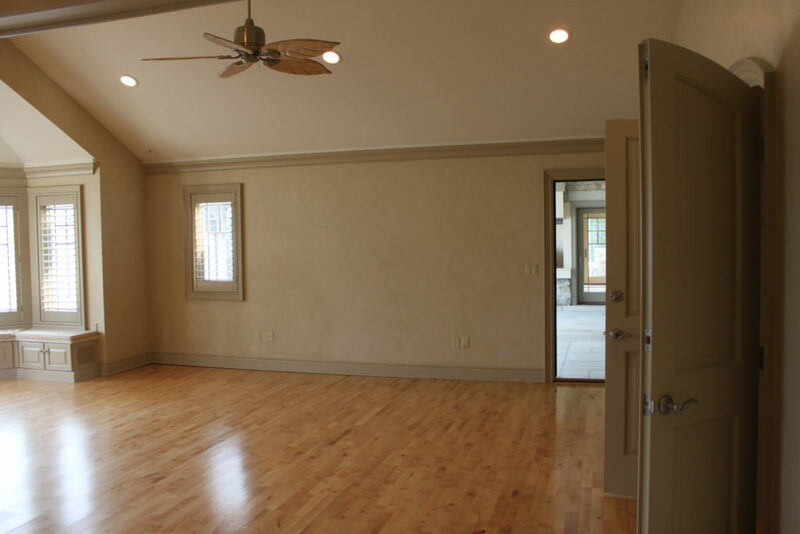 I have a south facing condo with tons of natural light that I need to paint. The floor is natural oak. Hi Sheryl! This home is painted in Sherwin Williams Agreeable Grey. 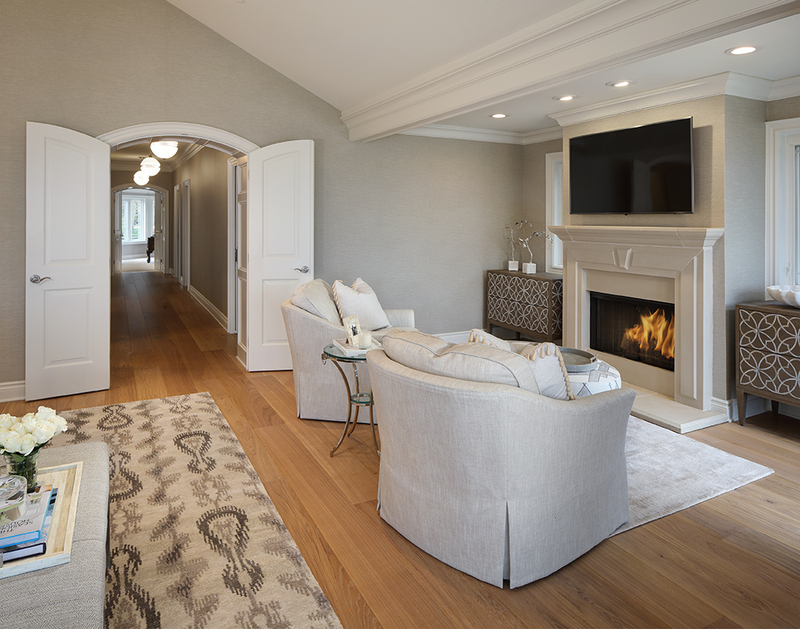 Be sure to paint a small space first and watch how it looks throughout the day. Grey can be tricky! Good luck! 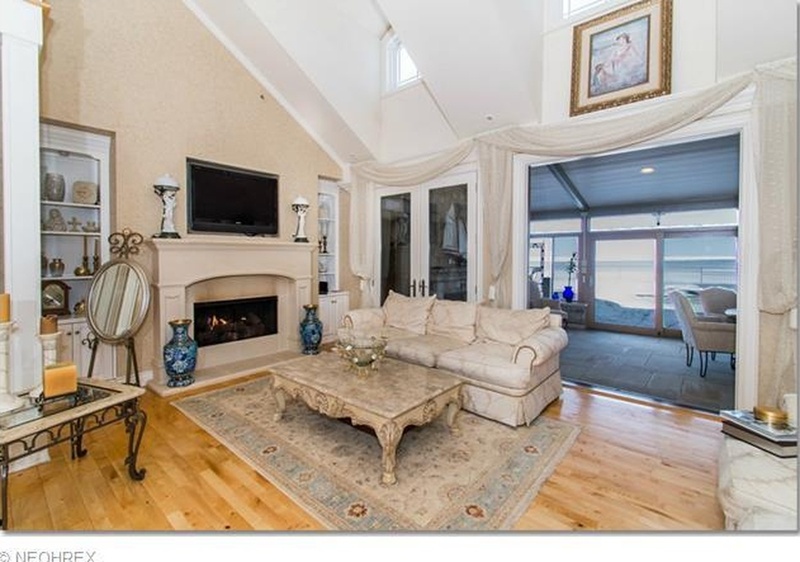 Can you tell me what color you painted the walls, trim and shiplap ceiling in the room that was the “sunroom” previously? Love the colors together. 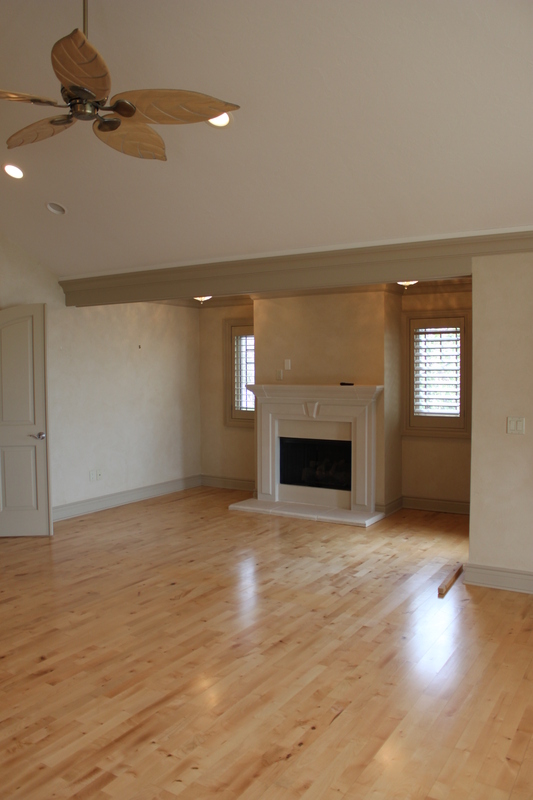 The walls are Sherwin Williams Agreeable Grey and the trim & shiplap is Benjamin Moore OC-17!